Prime Minister Eddie Fenech Adami (left) and Foreign Minister Joe Borg signing the Treaty of Accession at the EU summit in Athens yesterday. Picture: Lino Arrigo Azzopardi. Prime Minister Eddie Fenech Adami yesterday signed the historic European Union accession treaty in Athens, sealing the Maltese people's wish to see their country join the European family on May 1 next year. The treaty was signed by the leaders of the 15 member states and 10 acceding countries, as senior European Union figures hailed the day as a momentous occasion. The spectacular signing ceremony was held at the foot of the Acropolis, symbol of the world's first democracy, although it was marred by violent clashes between police and anti-war protesters. Dr Fenech Adami took his turn at the podium to make a short speech in Maltese before the assembled leaders and top officials of the European Commission and Greek European presidency. He emphasised Malta's European heritage and its people's European sense of identity, but he was also outward-looking, stressing the EU's important role in the Mediterranean and Middle East. It was the first time that Maltese has been used as one of the EU's official languages. The prime minister and Foreign Minister Joe Borg then signed the treaty on Malta's behalf, with President Guido de Marco witnessing the occasion. 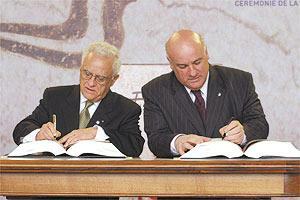 Chief negotiator Richard Cachia Caruana also put his signature on the treaty. "This is your home too now," Commission President Romano Prodi told the leaders of the new member states. "It is yours to cherish, to make yourselves at home in, to dream in, to adorn, to extend even further. "Today we open our arms to embrace and welcome these 75 million new European citizens." Greek Prime Minister Costas Simitis described the day as historic in all senses: "...we are overcoming the divisions of the continent that once divided us into two camps, east and west. This is an achievement which creates new obligations on us to look to the future with optimism and creativity." Dutch Prime Minister Jan Peter Balkenende said it was "only today that the Berlin Wall has truly fallen". Finnish President Tarja Halonen said she felt that there was great celebration in the air... "almost like in a wedding". Irish Prime Minister Bertie Ahern, paraphrasing Galileo, said: "Give me a lever long enough and a firm place and I will move the world. The European Union is a firm place to stand." The European leaders, including Dr Fenech Adami and President de Marco, were also part of the largest-ever European family photo. The leaders of the new member states, alongside Mr Simitis, Mr Prodi and Enlargement Commissioner Gunther Verheugen, addressed a joint press conference during which Dr Fenech Adami again spoke in Maltese with simultaneous translation for the other leaders and the journalists present. The prime minister said the Maltese had been dreaming about this day for a long time. He recalled how the Association Agreement that Malta had signed with the European Economic Community in 1970 had led to the strengthening and development of the country. "We consider the EU to be our home," he said. The Maltese were proud to see their country joining the Union. "Malta will enhance the Mediterranean dimension of the EU and will work in the interest of the Maltese people and for the common interest of the people of the Union." Mr Verheugen described this enlargement as "the most important ever." He stressed that the new member states would from the very beginning enjoy the full rights enjoyed by the other member states. He did not envisage that there would be any problems with the ratification of the treaty in the member states and acceding countries. Speaking to Maltese reporters later, Dr Fenech Adami said he was expecting the treaty to be ratified by parliament shortly after it was inaugurated. The day, he said, marked "a new beginning for Malta. A moment of new opportunities for the Maltese people". Now that the country had managed to secure its place in Europe, there was no going back. Despite his packed schedule, the prime minister managed to find the time to meet some 200 Maltese who travelled to Athens to be nearer the event. He was given a rapturous welcome, and reiterated that for Malta this was a dream that had come true. In his speech before signing the treaty, Dr Fenech Adami said that for the second time in succession, a European enlargement was being confirmed in Greece. "This is a fitting and symbolic coincidence because Greece is the cradle of much that we find essential in the European heritage. "The processes which have permitted today's celebration are rooted in the event of less than two decades ago which led to the downfall of the Soviet empire and the end of the Cold War. Today, as we celebrate the culmination of these processes, we recall that other peoples of Europe still have a last part of the way to go. "At a time when the limits of the potential extent of European enlargement are gradually coming into sight the task of looking outwards becomes both more urgent and more complex. The dramatic and tragic events in the Middle East of the last few weeks underline this reality. "It is therefore fitting that this summit, though dedicated to the latest enlargement, is also being coupled with a consideration of the issues arising from Europe's relations with its neighbours." He said that at every stage of the process leading to its accession, Malta has been inspired by the particular strength and depth of its own European heritage. "The Maltese people feel European in a very intimate sense - both personal and collective. This is a function of the uniqueness of the geostrategic location of our country, of the strong moral, spiritual and social values which we cherish, of the many vicissitudes which have shaped our history and of the solid institutions which underpin our society. "We are proud that we are today taking our rightful place among the members of the EU. We feel ready and eager to make our own contribution to this great European experience." Dr Fenech Adami also spoke about the destructiveness of conflict and the healing values of cooperation among nations and peoples, of which Malta was able to bring its own direct insight. "We fully recognise that at no point can we take peace for granted. Peace is a benefit for which we must strive, deliberately and collectively, at every step of the way." He also spoke about his vision of a shared sovereignty within the European family. "We deeply share the conviction that the sovereignty and identity of a people can only be reinforced through their sharing of this sovereignty and indemnity with others. Malta has all along been strongly committed to the processes of regional and international cooperation, of which the EU is an outstanding example." Dr Fenech Adami said that Malta was particularly conscious of the need to reassure neighbours that the EU is their constant friend and partner. "Malta brings with its membership a particular insight into the complex and sensitive situation of the Mediterranean. "We are especially aware of, and intend to make a direct contribution towards, the positive role which Europe can, and needs to, play in the promotion of security and cooperation in this region." Dr Fenech Adami concluded by stressing that the way ahead was not an easy task. "Membership of the Union is a means, not an end, in the pursuit of the ever closer integration of our continent. Yet we are encouraged by the fact that many are committed to the common objective and that the objective is indeed worth pursuing." The President of the European Parliament, Pat Cox expressed his satisfaction that enlargement was on track. "I am proud that the European Parliament voted by huge majorities to accept the applications of membership of the union from the 10 accession states." He emphasised that the coming year would mark a new phase in the enlargement process: "People and parliaments now decide. The work at the European level is concluded. So far three referendums in the accession states have been positive. Malta, Slovenia and Hungary have given the lead, but important tests lie ahead." He made an appeal to the national parliaments in the member states to meet the ratification timetable, so that everyone would meet the May 1, 2004 deadline. Mr Cox also praised the 10 acceding countries for the pace of the reform they had carried out in their countries.